On April 14, 1865, during a performance of the play Our American Cousin at Ford’s Theater, actor and Confederate sympathizer John Wilkes Booth slipped into the theater box and shot President Abraham Lincoln at point blank range before fleeing. Lincoln died on April 15th, becoming the first American president to be assassinated. Booth was eventually captured and killed by the Union army. You are likely familiar with the Lincoln assassination story, which was well documented thanks to eyewitness accounts. 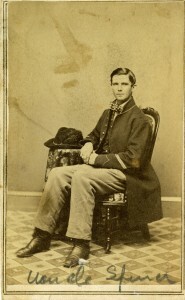 One of those written accounts came from a Wisconsin veteran named Spencer Bronson, who served in the 7th Wisconsin Volunteer Infantry during the Civil War and personally witnessed the tragic killing. Bronson was an avid writer (and a newspaper editor later in life) who regularly corresponded with his family in Columbia County, Wisconsin where he grew up. He was the sole survivor of three Bronson brothers who served in the war. You can see a photo of Bronson and other Civil War history for yourself at The Wisconsin Veterans Museum. Search our Civil War database here.